The Coen Brothers’ True Grit was one of the last films to be released in 2010; it is also one of the best. This adaptation of Charles Portis’ classic book, set in Arkansas and Oklahoma in 1877, is full of realistic acting, interesting characters and some intense but brief action scenes. The first adaptation of True Grit was released in 1969 starring John Wayne. This film might be best remembered for The Duke winning an Academy Award for Best Actor. The 2010 adaptation is not a remake of the 1969 film but a more accurate retelling of Portis’ book with a darker portrayal of the West than the 1969 version. This Coen Brothers film has many similarities to their other films in that the script is peppered with humor, there is very little action, the film has a dark tone, and the acting and story are both top notch. The plot of True Grit is easy to follow, hired hand Tom Chaney (Josh Brolin) kills the father of fourteen-year-old Mattie Ross, who is played in her debut role by Haileen Steinfeld. Ross seeks out the help of a scruffy, hard-drinking US Marshal named Rooster Cogburn (Jeff Bridges) to aid her in capturing Chaney. The duo is joined by Texas Ranger La Boeuf (Matt Damon) as he is hunting Chaney for killing a Texas senator. The characterization of La Boeuf and Cogburn are at the level they should be as characters from a book. Cogburn is a tough, drunken and dirty man. This is evidenced by his gruff speech and mannerisms. La Boeuf is characterized as more polite, but not as strong as Cogburn. He is also less likeable and has a smug attitude. However, at the end of the film La Boeuf steps-up and is a true hero. Both men portray their characters well, but the show is stolen by young Haileen Steinfeld’s charm and personality as Mattie Ross. The audience will see a great deal of depth in Ross’ character. She is strong willed but still needs the help of Cogburn and La Boeuf. In the beginning of the film she is fearless and determined. She has no issue dealing with men who are bigger and stronger than she is and this is evidenced by the way she speaks. She always talks with great confidence. Mattie is a girl who will get what she wants. Near the end of the film she is captured by Chaney and in this scene her character shifts. In the beginning of the movie she is a tough young woman, but while in Chaney’s captivity she becomes a defenseless girl, yet perseveres. Steinfeld’s acting is so believable and realistic that the audience may not realize the magnitude of the character shift. The Coen Brothers did a wonderful job in casting Steinfeld, as she competed against 15,000 other applicants for the part of Mattie. It will not be surprising if she wins an Oscar for this role. True Grit is very dark and shows the cruelty and brutality of the Old West. This movie does not paint a pretty picture of the west in which the good guys dress in white, play guitar and sing while riding their white horse. As in many Coen Brothers films, the stark feel of the west is lightened by several humorous lines from Steinfeld, Damon and Bridges. One particularly humorous scene occurs when Cogburn attempts to prove he is a better shot than La Boeuf by throwing cornbread in the air and trying to shoot it down to no avail. La Boeuf sits on his horse watching smugly. If the film did not have bits of humor, the darkness of the plot could be overwhelming. The action scenes are memorable, but are short and far between. The action sequences will have audiences on the edge of their seat, but before the scenes get a chance to reach a full climax, they end. In many westerns the hero has shot twenty outlaws before breakfast, but the body count in True Grit does not even make it to double digits. True Grit does not need action as it is obviously more about the story than the gunplay. The trailers painted this movie to be more of an action film than it is. 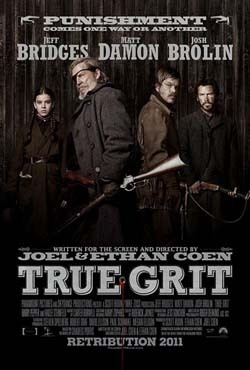 Despite the lack luster Old West action scenes, True Grit ranks as one of the best movies of 2010 and is highly recommended.